Howard shares his simple dairy-free take on the classic figgy pudding, the perfect gluten-free dessert to serve up after Christmas dinner. Drenched in an indulgently sticky caramel sauce, these puddings are extremely versatile and can be made even more festive with a little orange zest or cinnamon. 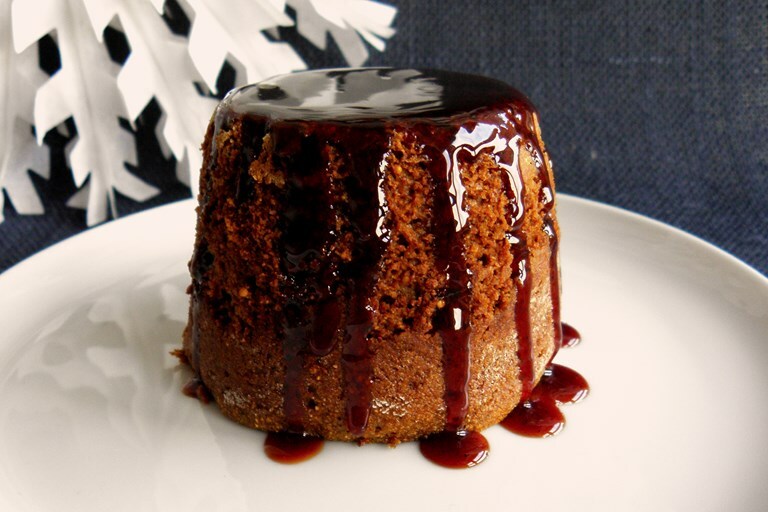 For an added bit of decadence, smother with Marsala or brandy before adorning the puddings with the caramel sauce. If your list to Santa includes a dairy-free pud that's lighter than the traditional offering and low in refined sugar, this could be a Christmas gift with your name on it. It's worth tracking down chestnut flour for its flavour and obvious seasonal connotations. By all means add a little cinnamon or orange zest if you fancy, but you will lose some of the subtle chestnut taste as a result. The caramel sauce takes just a few minutes to make – granted there's not a lot, but you really only need a little, don't you? If you crave indulgence you could add a scoop of (dairy-free) ice cream; if you crave alcohol you could anoint the puds with Marsala or brandy before pouring on the sauce . . . or just have a tipple on the side. The puddings dome dramatically when baked, so trim them level if the sight of a wobbly bottom smacks too much of impending New Year diets. Recipe taken from Howard Middleton's book Delicious Gluten-Free Baking published by Little, Brown.